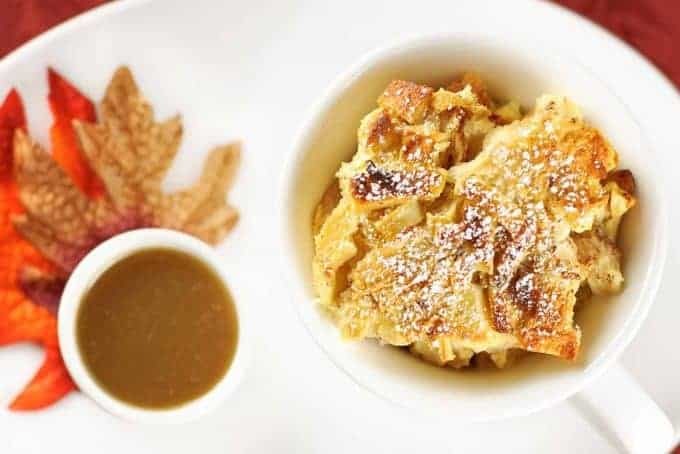 A caramel apple is a quintessential fall treat, and this fluffy and delicious bread pudding has all that flavor with the added grown-up treat of rum. 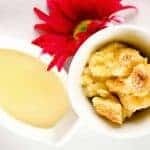 The bread pudding is versatile because it can be served warm or cold, so you can prepare it in advance. The caramel rum sauce should be served hot and prepared or warmed just before serving dessert. The perfect finish to an autumn meal, this bread pudding bursts with apple, caramel and rum flavors. Preheat the oven to 350°F and spray a 2-quart or 11×7 baking dish with nonstick coating. 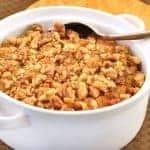 Spread the cubed bread evenly in the dish and top with the chopped apples. In a bowl, whisk together eggs, sugar, vanilla, cinnamon, nutmeg and salt. When thoroughly combined, whisk in milk. Pour the mixture over the bread and let stand for 30 minutes, occasionally pressing the bread with a spatula to help it absorb the mixture. 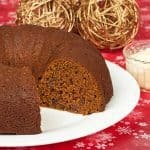 Bake in a water bath for 1 hour and 15 minutes, until the pudding is puffy and golden brown on top. For the caramel rum sauce, place the sugar in a small saucepan and pour the water and rum evenly over the top. Set over medium-high heat and swirl the pan until the sugar is well dissolved. Turn the heat up to high and continue swirling until the syrup turns a deep amber color. Be sure to keep an eye on it – it can easily burn! As soon as the syrup reaches the right color, remove it from the heat immediately and add the butter. Whisk gently until the butter is incorporated, then stir in the heavy cream. If the syrup turns lumpy, set it over low heat and stir until smooth. Add the vanilla and salt, stir and transfer to a serving bowl. The sauce can be refrigerated and reheated in a saucepan over very low heat. Serve the bread pudding warm, drizzled with the caramel rum sauce and sprinkled lightly with confectioners’ sugar. 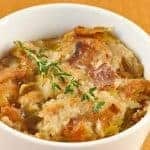 Leftover bread pudding can be reheated at 325°F for 15 minutes. You can use any nice white bread for a bread pudding, but challah gives the dish a lovely fluffiness. You’ll want to trim most of the crust off before cubing the bread. Check our article ~ “Bain-Marie: A Water Bath” for tips and guidelines on this technique. I’d love to serve this at a party.